Many savvy cooks know that tahini is a key ingredient in hummus, a popular spread eaten around the world. But you've probably wondered, what is tahini? Tahini is a paste made from ground, toasted sesame seeds. The seed butter is a staple in many cuisines and has a distinctive nutty taste that can sometimes be described as acidic or bitter. But don't worry, if you don't like to use this paste, you can use a tahini substitute in hummus. There are two different types of carbohydrates in tahini. Some of the carbohydrate in tahini is fiber. Fiber not only helps to boost digestive health, but fiber also helps to regulate blood cholesterol and boosts satiety—the feeling of fullness after eating. Sesame seeds (which are used to make tahini) are a high fiber food—with each tablespoon of the whole, dried seeds providing just over 1 gram of fiber. You'll benefit from about 1.5 grams of fiber when you consume a 1-tablespoon serving of tahini. That is 6 percent of the recommended daily intake for most adults. The remaining carbohydrate in flaxseed is starch. Starch is a good source of energy for the body. There are no sugars in tahini (unless sugars are added in the brand that you buy, but that is very unusual). Because there is no sugar in this food, the estimated glycemic load of tahini is zero. Glycemic load takes into account the serving size of a given food or beverage to estimate the food's impact on your blood sugar. It is considered to be more helpful than just using glycemic index for people who are choosing foods based on their effects on blood glucose. There are just over 7 grams of fat in a tablespoon of tahini. There are three different types of fat in the paste. Most of the fat in tahini is polyunsaturated fat (3.2 grams), which is considered to be a "good" fat. Polyunsaturated fat is usually liquid at room temperature and may boost heart health when you use it to replace less healthy fat (like saturated fat) in your diet. There are two different kinds of polyunsaturated fatty acids (PUFAs) and tahini contains both of them. You'll get just over 54 milligrams of α-linolenic acid (ALA) omega-3 fatty acids in a serving of tahini. And you'll get 3,099 milligrams of linoleic acid or omega-6 fatty acid. There are 2.7 grams of monounsaturated fat in a single serving of tahini. Monounsaturated fats are found in plant foods and are liquid at room temperature, but usually start to harden when chilled. Lastly, there is a very small amount (just 1 gram) of saturated fat in a single serving of tahini. Saturated fats raise your LDL cholesterol levels, so health experts generally advise that we limit this type of fat in the diet. There are almost 3 grams of protein (2.7 grams, to be exact) of protein in tahini if you consume just one tablespoon. Tahini provides important micronutrients. However, because the serving size is usually small, the nutritional boost you get from consuming the seeds will only put a small dent in your total daily vitamin and mineral needs. You will get 13 percent (0.2 milligrams) of your daily recommended intake of thiamin if you consume a tablespoon of flaxseed and you follow a 2,000 calorie-per-day diet. Thiamin is a water-soluble B vitamin that is needed by the body to metabolize carbohydrate and branched chain amino acids. It is also vital for neural function. You’ll also benefit from about 4 percent (0.9 milligrams) of your daily recommended intake of niacin and about 4 percent (14.7 micrograms) of your recommended intake of folate. In terms of minerals, you'll get about 11 percent (0.2 milligrams) of your daily manganese needs met, about 12 percent (0.2 milligrams) of your daily recommended intake of copper, and 11 percent of your daily intake of phosphorus. Other minerals in tahini include zinc, magnesium, calcium, and iron. The sesame seeds used to make tahini are widely credited with health benefits. In fact, health experts at The University of California Berkeley refer to them as the "queen of seeds." However, the source also reports that while people associate substantial benefits with sesame seeds (including improved digestion, diabetes, and cancer prevention), not all of the benefits are supported by science. So what can tahini actually do for your health? The fats in the seeds can provide certain benefits. Polyunsaturated fat can help to lower your LDL cholesterol (sometimes called "bad cholesterol"), thereby helping to reduce your risk for heart disease. Omega 3 fatty acids found in sesame seeds reduce triglycerides, may reduce the risk of an irregular heartbeat, slow the build of plaque in your arteries, and may even help to lower blood pressure. The omega-6 fatty acids in sesame seeds may help to control blood sugar, reduce your risk for diabetes, and may also help to reduce blood pressure. The monounsaturated fat in sesame seeds helps you to develop and maintain healthy cells, boost your immune system, and promote healthy vision. It is important to remember, however, that even though some fats may provide health benefits, nutrition experts recommend that you limit fat in your diet. Fat provides 9 calories per gram (as compared to 4 calories per gram for carbohydrate and protein), so a diet higher in fat can lead to weight gain. Where can I buy tahini? Tahini used to be a hard-to-find ingredient in the United States. American buyers would generally have to visit a store specializing in Middle Eastern foods to buy it. However, as its popularity has increased, so has its presence in markets and grocery stores. It is likely that you will find tahini in the condiments aisle of your supermarket. It can also be purchased online. Are there different kinds of tahini? Yes. Most tahini is made from white or light sesame seeds and is lighter in color (similar to the color of peanut butter), but you may also see black tahini at your local grocer. Black tahini is made from black sesame seeds and has a darker, more intense flavor. Lastly, you'll see seasoned tahini on some store shelves. As you might imagine, this type of tahini has seasonings added before packaging. Are there any ingredients in tahini other than sesame seeds? Usually, there are no other ingredients in tahini other than ground, hulled sesame seeds. However, sometimes (but rarely) oil is added for consistency. How do I store tahini? Unopened tahini does not need to be refrigerated. However, once it is opened many cooks store it in the refrigerator to prevent the oil from becoming rancid. Tahini will keep for several months when refrigerated. Before using tahini, you will need to stir the paste vigorously, as it naturally separates when left standing. What if I don't like tahini? Can I use a tahini substitute in hummus? 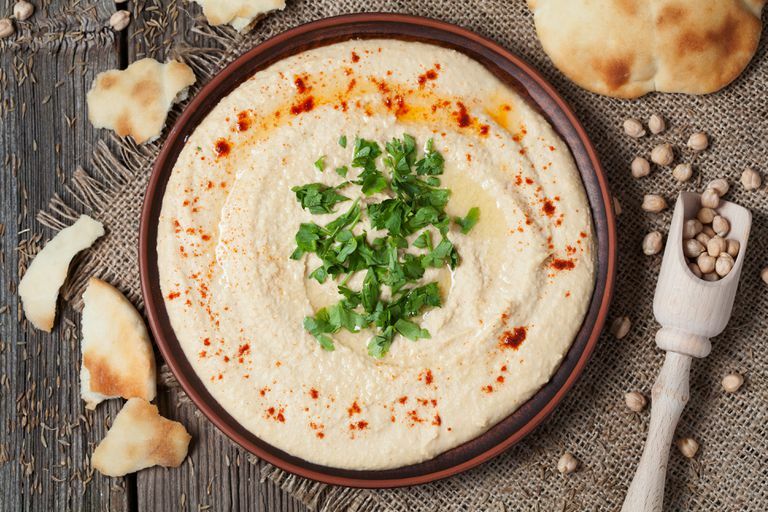 While tahini is a key ingredient in hummus, some cooks make the popular dip without tahini to reduce the fat and calories. In fact, you don't need to use a tahini substitute at all, you can just eliminate the paste and blend hummus with the other key ingredients. In other recipes, you may be able to use other nut butters as a tahini substitute, or you can add sesame oil to recipes to get the sesame flavor in tahini. Hummus is the most common way that many American cooks use tahini. The seed paste provides a creamy nutty flavor that makes hummus perfect for dipping vegetables, pita chips, and crackers. To make hummus, simply blend chickpeas with tahini, garlic, lemon, and a dash of salt. Because hummus has become so popular, you'll find many variations in the market. There are breakfast hummus products that are blended with fruit (such as blueberry, strawberry, and cherry) and savory hummus flavors including garlic and roasted red pepper. But there are many other ways to use tahini that do not involve hummus. Tahini has a spreadable texture that makes it a great addition to sandwiches. In fact, some people use certain brands of tahini like they use peanut butter. You can also use tahini to make baked goods (cookies and muffins), salad dressings, soups, and sauces. Sesame allergies are on the rise, according to a published report. Researchers say they don't know if there has been an increase in reports because of improved awareness of sesame seed products or an increase in sensitivity to the seeds. Unfortunately, if you are allergic, it may be difficult to avoid products that contain sesame since sesame does not have to be disclosed as an ingredient in foods. However, tahini will always include sesame seeds, so if you know that you have a sesame allergy, you should always avoid tahini. Symptoms of a sesame allergy may range from mild to severe and can include difficulty breathing, itchiness around the mouth, and other symptoms including anaphylaxis. According to Food Allergy Research & Education, sensitivity ranges from person to person, but the organization recommends keeping an epinephrine auto-injector on hand if you have an allergy to sesame. Published studies report that sesame seeds negatively interact with the medication. Some sources also recommend that patients taking medications changed by the liver, antidiabetes medications, or medication for high blood pressure should be cautious when consuming sesame. Check with your health care provider if you are taking medication to be sure that consuming tahini or other sesame products is safe for you. Sesame. The Natural Medicines Database. Professional monograph. Dalal I, Goldberg M, Katz Y. Sesame seed food allergy. Curr Allergy Asthma Rep. 2012;12(4):339-45. DOI: 10.1007/s11882-012-0267-2.